Happy Fourth of July, everyone. 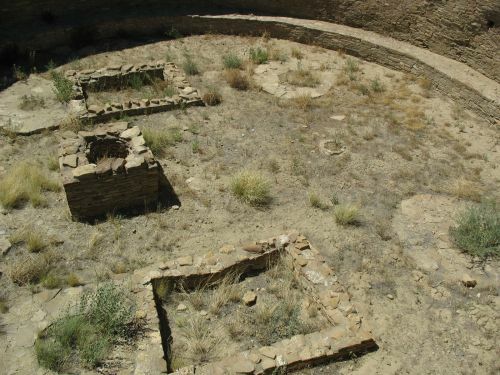 The Fourth is actually a pretty important date for the study of Chaco, but in a roundabout (and somewhat controversial) way. It all has to do with a very famous pictograph panel below Peñasco Blanco at the west end of the canyon. While the interpretation of this panel is a matter of considerable debate, one way it’s been seen is as a record of an astronomical event that is known to have occurred during the height of Chaco’s power and influence: the supernova of 1054, which formed the Crab Nebula. We know from several Chinese reports that the “guest star” resulting from the supernova first appeared on July 4, 1054 and continued to be visible day and night for almost two years. There are a few Japanese records of the supernova as well, along with one report from the Arab world. No clear-cut and unambiguous accounts are known from Europe or elsewhere in the world, although a few rock art panels in the Southwest have been proposed as representing the event. The most famous of these is the one at Chaco, which is often referred to as the “Supernova Pictograph” (even by the park itself in a sign at the site). It consists of three symbols painted onto the rock face in red: a hand, a crescent, and a starburst-like shape. It’s the starburst that has been interpreted as representing the supernova itself, of course, and the crescent has been seen as representing the crescent moon. On the morning of July 5, the moon, which was a crescent at the time, would have appeared in roughly the same relationship to the supernova, as seen from the pictograph site, as the relationship between the two symbols on the panel. Furthermore, the handprint points in the direction one would have looked to see this at at the time. 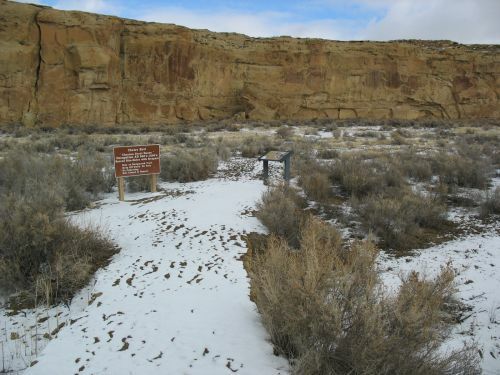 The combination of the three symbols together, plus the fact that this would have happened at a time of considerable activity in the canyon, has led some to suggest that this pictograph panel was created to commemorate this historic event. The specific location may have been an established sun-watching position, from which the new star was seen unexpectedly and recorded. 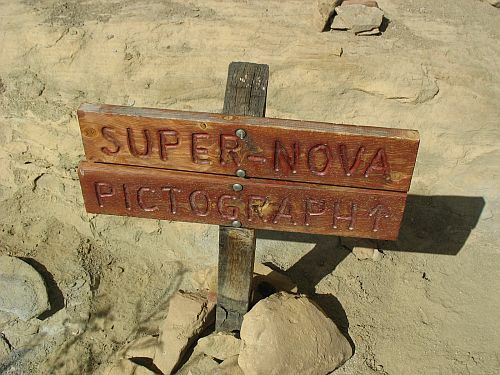 Sign at the "Supernova Pictograph"
It all sounds fairly plausible as it goes, but there are some problems with this theory. 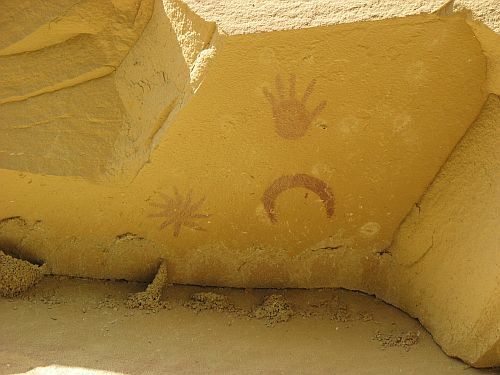 Probably the biggest problem is that the specific set of symbols on the panel is known from ethnographic evidence to have been used by the Zunis to mark generic sunwatching sites, with the crescent representing the moon, the starburst representing the sun, and the hand marking the location as sacred. Now, it’s certainly possible that these symbols came to be associated with this activity as a result of the observation of the supernova at this site, but as far as I know there’s no reference to the supernova in ethnographic descriptions of astronomical observation at Zuni or any of the other modern Pueblos, so this is a pretty tenuous claim. Furthermore, while the 1054 supernova would certainly have been noticeable at Chaco, there was an earlier supernova in 1006 (also recorded by the Chinese, and possibly by the Hohokam in southern Arizona) that was much brighter, and it’s not clear why the Chacoans wouldn’t have recorded that one too. It took place before the Chaco system really got going on a regional scale, but there was plenty of activity in the canyon during the 900s, so people there would presumably have seen it. It’s possible that it was recorded too, at some other site that hasn’t been found or that has disappeared in the thousand years that have elapsed since the event (note that the existing Supernova Pictograph has only survived because it was under a protective overhang), but again, there’s not any evidence for this. The Chacoans are definitely known to have kept careful track of regular patterns in the skies, such as the solstices and the lunar standstills, so they surely would have seen unusual events such as supernovae, but it’s not clear how they would have reacted to them or how inclined they would have been to record them. View Looking East from "Supernova Petroglyph"
So it’s not really clear how to interpret the Chaco pictograph. I think the balance of evidence at this point leans slightly against it being a representation of the supernova, but I could be talked out of that position if some additional evidence for the supernova theory can be found. Others, however, have proposed even more extreme theories based on the 1054 supernova. Among the more noteworthy of these is a proposal by Timothy Pauketat and Thomas Emerson, in a 2008 article in the Cambridge Archaeological Journal, that the rather sudden florescence of the Cahokia site in Illinois around AD 1050 may have had something to do with the supernova. The theory they present is interesting, but hard to effectively support. For one thing, dating methods in the Midwest are much less precise than in the Southwest, so pinning down any event to the year is usually not possible. There is certainly a suggestive correspondence between the sudden rise of Cahokia and the supernova, however, and this is supported by the apparent use of stellar imagery and symbolism at Cahokia and the importance of the stars to later cultures in the area, so there may well be something to this. Now, it’s true that there is a single tree-ring cutting date from Casa Rinconada that dates to 1054. This is, however, the only tree-ring date for the site, so while it’s plausible that it dates the construction of the site this definitely cannot be stated as definitively as Pauketat and Emerson state it here. There is no specific provenience information available for this beam, so there’s no way to tell how it was used and whether it can plausibly be said to date to the initial construction of the site. The general architecture of Casa Rinconada is consistent with a construction date in the 1050s, but without more specific information tying it to a specific year on the basis of one unprovenienced beam is unwarranted. Furthermore, even if Rinconada was built in 1054, that doesn’t establish that it was built because of the supernova. 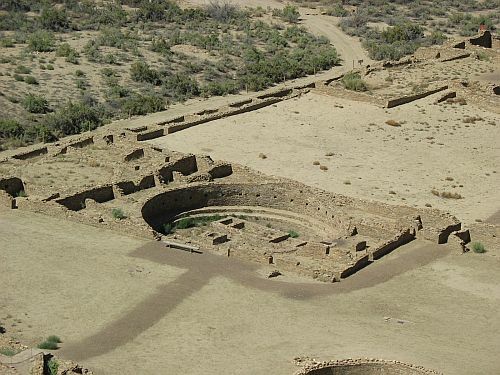 There was extensive construction in the canyon throughout the mid-1000s, associated with Chaco’s apparent rise to regional dominance, and this began well before 1054. 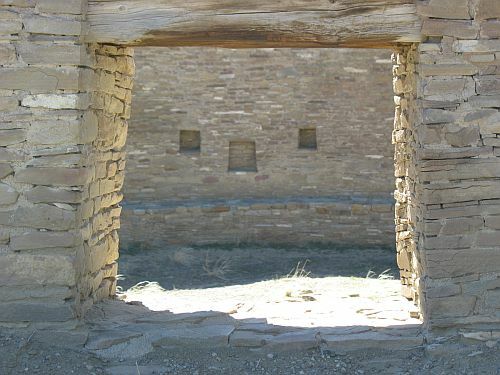 The major expansion of Pueblo Bonito began by the 1040s at the latest, and various other construction projects at other sites in the canyon dates to this general period. Rinconada could easily have been part of this general process without any specific relationship to the supernova. Indeed, there’s nothing about Rinconada that seems to refer to the supernova, despite the various astronomical alignments (some of them controversial as well, it should be noted) identified there. None of this means that the supernova didn’t have an important role at Cahokia, of course, and it doesn’t even rule out an important role at Chaco itself. It does mean, however, that developments at Chaco shouldn’t really be used as evidence for developments at Cahokia, even though the two sites are contemporaneous and Chaco can be dated much more precisely. Cahokia may well have risen as a result of the 1054 supernova, but neither the Supernova Petroglyph at Chaco nor the one tree-ring date at Casa Rinconada provides evidence that it did. There’s a spot near the west end of the Pueblo Bonito parking lot, close to the spot where guided tours begin, where you can yell something in the direction of the canyon wall and hear a very clear echo back. Some of the tour guides at Chaco regularly demonstrate this impressive effect when beginning their tours, and it’s certainly an interesting way to capture people’s attention. I never did it myself; I’m generally averse to this sort of thing because I’m never confident that I’ll get it quite right, and it would be very awkward if I tried it and it didn’t work. (There’s a similar effect in Statuary Hall in the US Capitol which I never demonstrated when I gave tours there either.) This is kind of silly, though, and says more about me than about the echo. In general I think highlighting this kind of acoustic effect is a good way to show just how special Chaco is, and while this particular echo is in a very accessible location there are many other places in the canyon with similar characteristics. 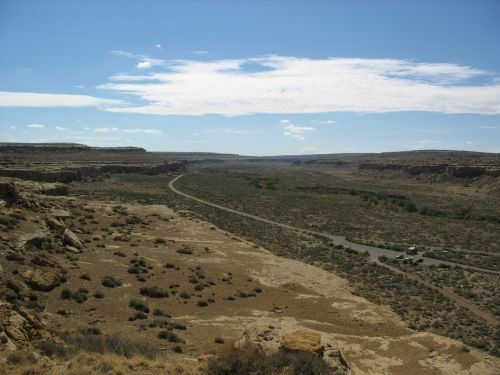 There are several places in and around Pueblo Bonito where you can hear with crystal-clear precision everything people say up on the Threatening Rock overlook, and there are some spots where you can even hear things clear across the canyon. These effects have been known to the park’s interpretive staff for a long time, but until recently they’ve received very little attention from scholars. 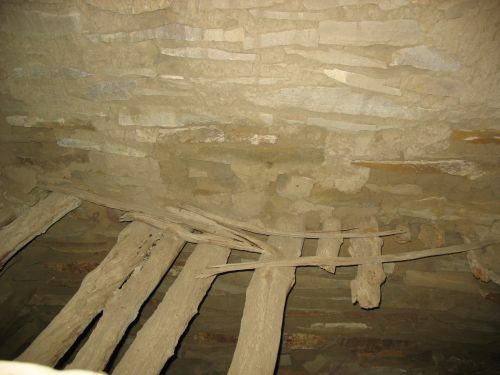 In the past few years, however, the growing field of archaeoacoustics has begun to look rigorously at echoes and other acoustic phenomena in the canyon with an eye to understanding what role they may have played in Chaco’s past. 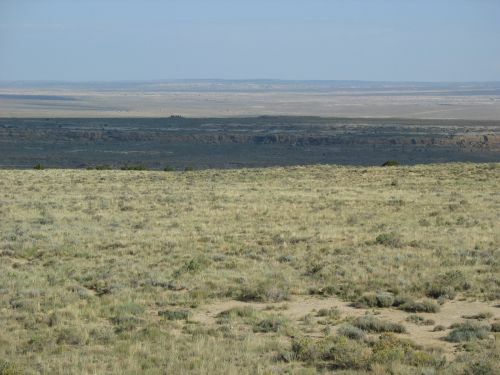 Rich Loose, a former archaeologist and old Chaco hand, has been at the forefront of this research, in collaboration with our old friends John Stein and Taft Blackhorse. Rich recently sent me a couple of articles of his that have recently been published on this issue, along with a paper by John and Taft that I don’t think has been published anywhere. 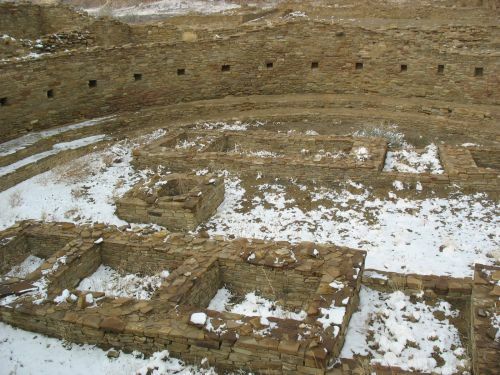 The most important of these articles, I think, is one in which Rich describes in detail the research the team has done at the so-called “Chaco amphitheater” between Pueblo Bonito and Chetro Ketl. Using sophisticated recording equipment and acoustic analysis software, they made a series of recordings of different sounds produced in various locations in and around the amphitheater and determined many of its important acoustic properties. They also examined the cliff face in this area and concluded that there was considerable evidence that it had been deliberately sculpted, perhaps to improve its acoustic properties or for other purposes related to its use as a performance venue. There is some evidence that there may have been a masonry wall along at least part of the sculpted area which could have created a “backstage” for performers, which Rich compares to the “secret passage” at Casa Rinconada. There are also three large holes in the cliff face which appear to be natural but may have been enhanced as well. One of these is large enough to fit a person and leads to a small cave that can apparently fit multiple people (though presumably in very close quarters). Again, this has interesting implications for possible stagecraft. One of the most interesting discoveries in Rich’s paper involves a small hill on the other side of the canyon, near Casa Rinconada, which he concludes was almost certainly deliberately constructed artificially for some purpose related to the amphitheater. This hill, which is quite prominent and which I have often wondered about, apparently doesn’t show any sign of covering up a small-house site like the ones surrounding it, but neither does it appear to be natural. 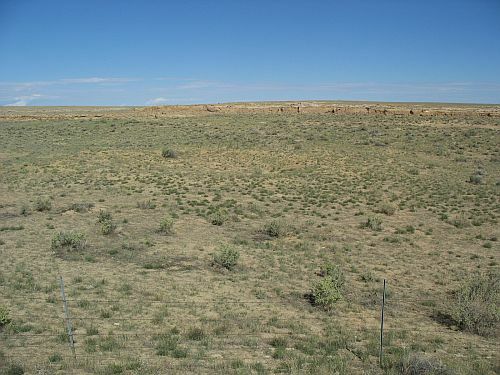 It is, however, located almost exactly on the line along which sound from the amphitheater focuses, which also seems to coincide almost exactly with the north-south line between Tsin Kletzin and Pueblo Alto. Sounds played from the hill could be clearly heard in the amphitheater, although their source could not easily be ascertained from there, and even speech from the hill could be heard in a somewhat garbled manner. As with archaeoastronomy, archaeoacoustics suffers from the persistent problem that there’s no way to know for sure if the patterns it discovers are real or due simply to coincidence. Rich is quite open in acknowledging this shortcoming in his articles. In the absence of any means to verify results completely, a compelling combination of separate types of evidence is the best way to support an argument that the acoustic properties of a place are not accidental but reflect conscious decisions on the part of ancient people. In the case of the Chaco amphitheater, I think Rich’s results clearly meet this standard. Again as with archaeoastronomy, it’s hard to say what the specific implications of all this are for understanding prehistoric behavior, but in this case the acoustic evidence seems to shed at least some tentative light on several mysteries about Chaco. 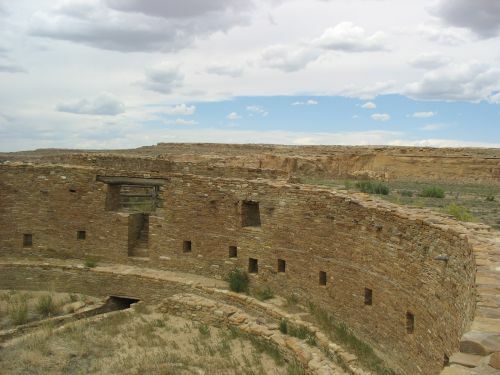 One of these is the nagging question of why Chaco was chosen in the first place as the location for such a grandiose center, given that it has no apparent natural resources and is in a particularly harsh and inhospitable location even by local standards. 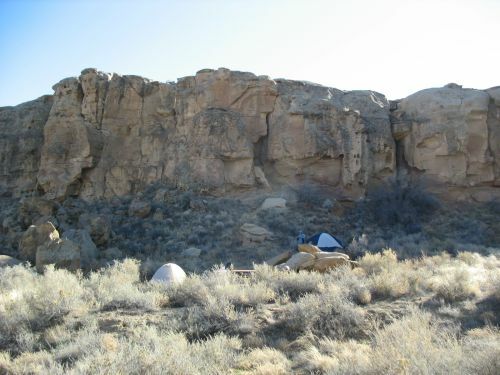 The acoustic properties of the canyon walls, however, which as I noted above are not limited to the phenomena at the amphitheater specifically, provide one possible answer. 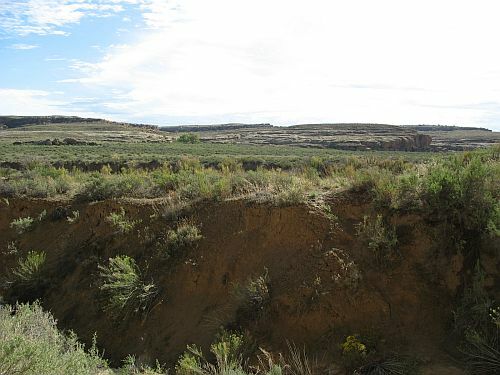 The main way in which Chaco does differ from the surrounding San Juan Basin is that it is, of course, a canyon, and has a long stretch of exposed sandstone cliffs with acoustic effects that can’t be found in many other places nearby. 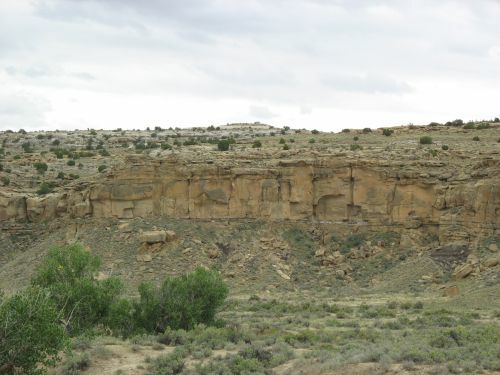 This doesn’t necessarily explain its advantages in a larger geographic context, of course, and there are many other places just a bit further away with similar sorts of cliffs, but it does potentially shed some light on the question of what leverage the Chacoans would have had over other people in the area that they could use to gain their important position in the region. People often gesture vaguely to “spiritual authority” or something similar in trying to explain this, but the acoustics provide an explanation for how a reputation for spiritual power could arise in the first place. The position of the amphitheater at the center of the canyon, at the intersection of many alignments between buildings, certainly suggests that it was an important focal point for the area, and the acoustic characteristics are very suggestive. Since this research involves John Stein and Taft Blackhorse, of course, Navajo oral traditions also enter into the story. 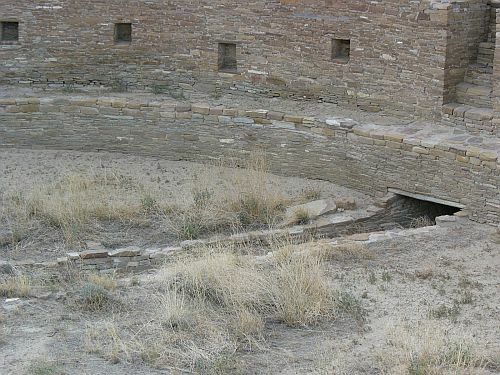 Specifically, the unpublished paper by John and Taft talks about a connection between the amphitheater and a ritual involving the use of the hallucinogenic datura plant, as well as a connection to the Great Gambler (specifically that the Gambler came to Chaco to take advantage of the powers associated with the amphitheater). 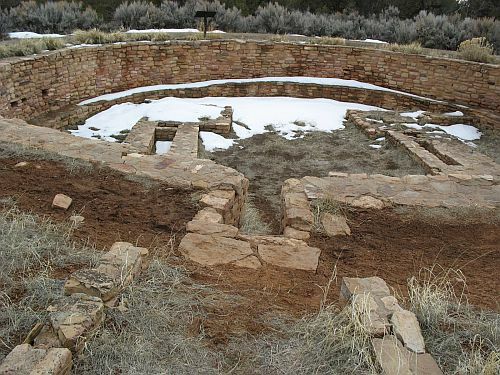 Indeed, they even say that the amphitheater is still used by “Navajo ceremonial practitioners,” which Rich incorporates into his articles as a key piece of evidence backing up his acoustic studies. I’m a little dubious about a lot of this, and I intend to look into it further, but I do think oral traditions are an important place to look for an independent line of evidence to serve as a check on conclusions derived from archaeoacoustic (and archaeoastronomical) research. I found the shell trumpets to be one of the easiest ways to produce a loud stimulus for an echo. They are simple, easily portable, don’t require batteries, and are nearly foolproof once you master the technique of blowing one. As luck would have it, Barbara Mills and T. J. Ferguson have recently published an important article on shell trumpets in the prehistoric Southwest in which they record all the places they have been found and try to see what conclusions about prehistoric ritual and ideology can be drawn from the distribution of trumpets through time and space. They conclude that there are at least two separate ideological systems associated with shell trumpets: one having to do with the plumed serpent and associated with rain and agricultural fertility, and another having to do with warfare and healing (these might be two separate traditions, in which case there would be a total of three traditions). 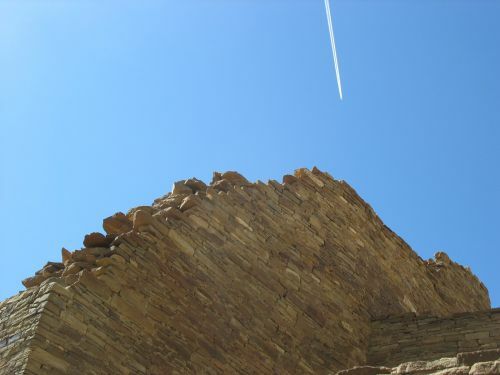 Temporally, they find that the plumed serpent tradition, which is quite strong at Hopi and Zuni today, appears rather suddenly in the early fourteenth century, a time of considerable population movement and cultural change, and may have something to do with influence from the major center at Casas Grandes in Chihuahua as well as with migration of large numbers of people from the southern Southwest into the Pueblo region. 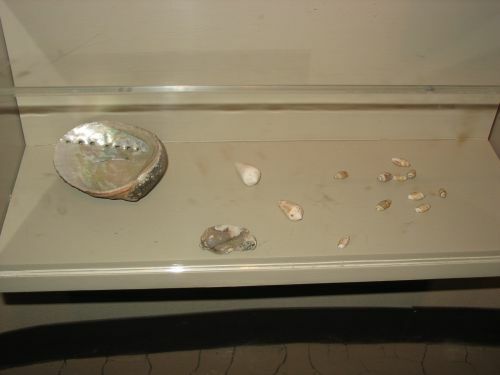 During this period conch shells are found primarily at Casas Grandes and in a large area of east-central Arizona along the Mogollon Rim, as well as in the Hohokam region of southern Arizona and as far east as Pecos. There is basically no evidence for plumed serpent iconography earlier than AD 1300, although there are conch shells. 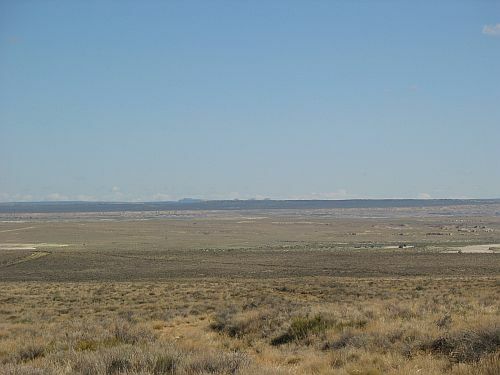 Their distribution is much more limited, however, being confined essentially to the Hohokam region and Chaco, although there is one isolated example from the Mimbres area of southwestern New Mexico. 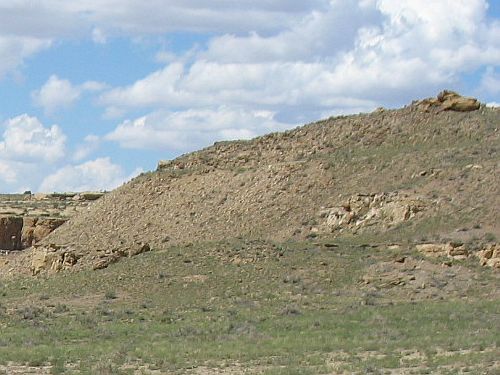 The geographic isolation of Chaco is striking on their map of sites where conchs have been found; there don’t seem to be any examples from any other sites on the Colorado Plateau during this period, despite the large population of this area and the presence of many strongly Chacoan-oriented or -influenced regional centers. Apparently there were no shell trumpets even at Aztec, which is in general pretty similar to Chaco in the numbers and types of valuable artifacts found. There were a bunch of them at Chaco, however, at least 17 overall, and all except two of them came from Pueblo Bonito specifically. 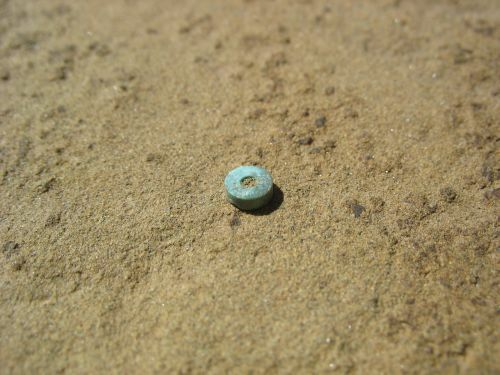 Within Bonito they were generally found in significant locations such as rooms containing other rare artifacts and a wall niche in Kiva R, rather than in trash deposits, which suggests that they were particularly important items. One was found in Room 33, and four were found in Room 38, which also contained many rare items of apparent ritual significance as well as macaws. 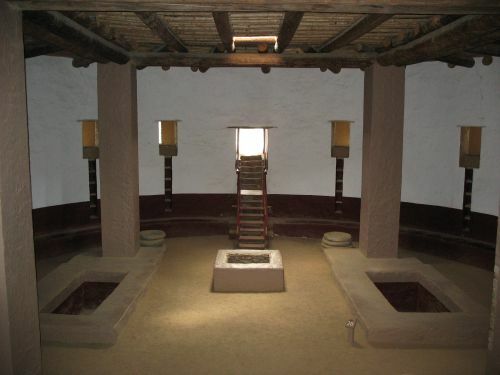 Others were found in Kiva A (the great kiva in the east plaza) and Room 6 (one of the earliest rooms in Old Bonito). Clearly, then, conch trumpets seem to have been associated very closely not just with the Chacoan system or Chaco Canyon in general but with Pueblo Bonito specifically. And Pueblo Bonito, of course, is right next to the amphitheater. The combination of the impressive acoustics of the amphitheater with the exotic sound of the conch shell would likely have been pretty powerful, perhaps in more ways than one. So what light does this combination shed on the Chacoan system overall? Well, it’s hard to say for sure. Mills and Ferguson make a strong case that the Chaco and early Hohokam conchs are associated with the warfare/healing complex rather than the plumed serpent one. Evidence for this complex comes mainly from Zuni, where there are many stories about the use of a “Big Shell” that was used to magically defeat the enemies of the Zunis. There is also an association between this shell and witchcraft, both in fighting it and in possibly causing it. The (non-witchcraft-related) healing part of the complex comes from one of the medicine societies, best known at Zuni but apparently also present at Hopi and Zia, and historically at Laguna. This society is apparently named for a “spiral shell,” and its rituals include shells, but otherwise it’s not clear how much it has to do with conch shells or trumpets specifically as opposed to shells more generally. The songs of the society at Zuni are said to be in the O’odham language of southern Arizona, and its origin story mentions a series of long migrations. To me this combination suggests a Hohokam origin about as clearly as is conceivable, and it’s possible that at least some of the Hohokam conchs, particularly the small ones that may have been used as standards on staffs rather than as trumpets, may have been associated with a precursor of this society. As I said, though, I’m not totally convinced that conchs specifically have anything to do with this society. 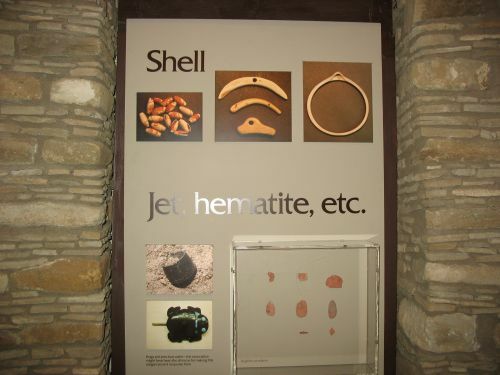 Shells of all kinds were a very big deal among the Hohokam. 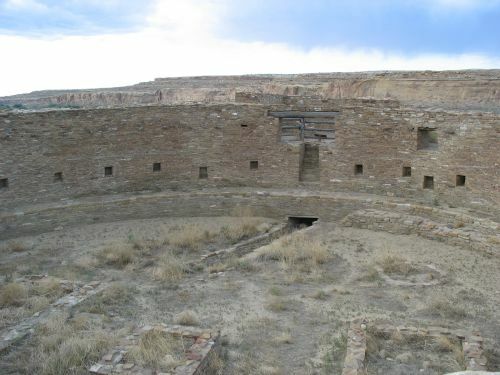 So, given all that, it seems likely that if any conch-related ritual complex in the modern Pueblos is related to the conchs at Pueblo Bonito it’s the Zuni Big Shell, associated with warfare and witchcraft. This is certainly intriguing, especially given the odd and ambiguous evidence about Chaco’s connections to warfare, although I think it’s ultimately inconclusive. As Mills and Ferguson point out, it’s entirely possible that some of these prehistoric complexes have no modern equivalents at all. Indeed, given the massive series of cultural changes and migrations separating Chaco from the modern Pueblos, it would hardly be surprising that the ritual traditions closely associated with Chaco specifically would have been lost or abandoned in favor of newer (or perhaps older) rituals considered more suited to the changing times. 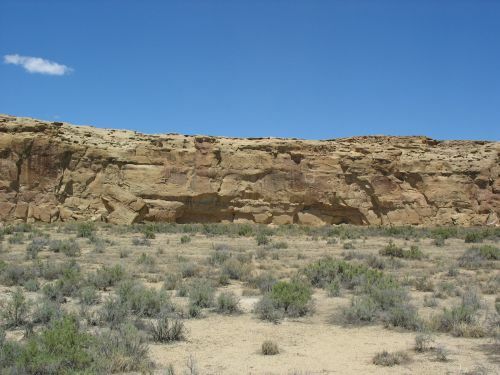 It’s noteworthy that there don’t seem to be any modern (Pueblo) practices involving a combination of conch trumpets and cliff faces with special acoustic properties, given the strong circumstantial evidence that the two were connected at Chaco. Whether or not any modern practices involving shell trumpets can be traced back to Chaco, however, the evidence for their importance at Chaco itself at its height is evocative and provides a hint of what Chaco may have been like for the Chacoans, even if what we hear today is only a faint echo of what they heard then.